Do you want to make your own vertical herb spiral garden? This compact space saving design can be made with just a few basic steps. Construction materials and methods vary so after deciding on the best position and gathering your materials, you can have one built the same day. Basically the idea behind the spiral; garden is to get as many different herbs as possible in a confined area. The spiral and the subsequent height differences mean that you create a number of different environmental conditions which normally would not be possible in a small space. The small area also means that they are ideal for a small garden and harvesting and watering is easy. 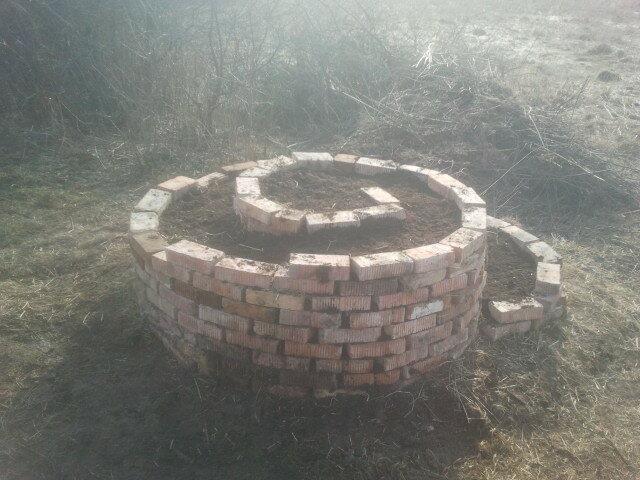 How it works is that you have a spiral bed in which to plant, this is held together with a structure of rock, brick or anything really that can absorb the heat of the sun through the day which in turn heats the soil. The top of the spiral gets more sun and has significantly more drainage than the lower parts, which informs your choice of planting. This means that you are able have thyme growing almost next to mint or ramsons. 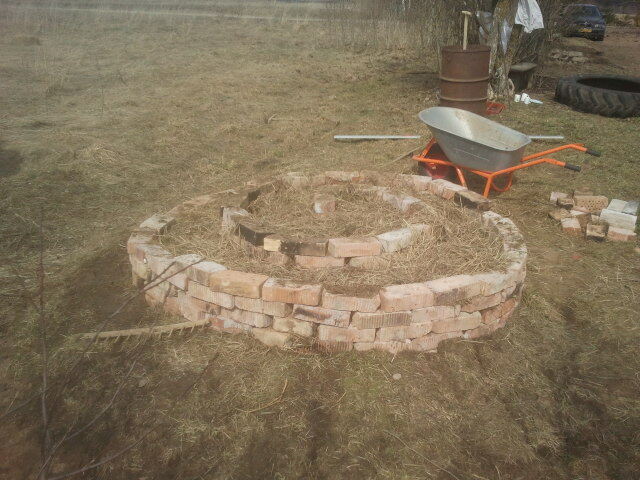 To build your spiral you first need to select a site, about 2m. across, this ideally wants to be close to the kitchen but if this means that you have to site it in the shade then you will have to settle for a longer walk. This is at the heart of permaculture principles the siting of your spiral will depend on finding an area which receives enough sun light to keep herbs happy and is not so far away from the house that does not get any use. When you have found an ideal compromise between the two measure your circle by estimating the middle and sticking a stick in with a piece of string 1m. in length attached to it. This will give you the arc of the circle, use a knife or something which makes a mark to mark this out. There is no reason for it being exactly round, you may just want to do it by eye. Around the outer circle lay a thick layer of cardboard with all the plastic removed, or newspaper, this simply stops weeds growing up through the rocks. Try and face the end of the spiral towards north so as to improve the efficiency, this will make sure that the micro climates you are trying to create are in an ideal situation. Now comes the fun part, getting your bricks or what ever you can lay your hands upon. 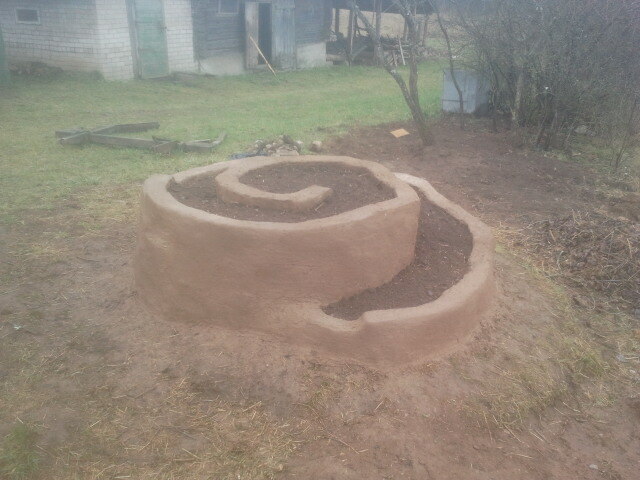 Start by laying out the shape of the spiral on the ground, this will be your foundation. The bricks around the edge need be only one or two layers deep, it’s the middle that you need height. Try and aim for about one meter but again this is not a rule. As the wall gets higher start to infill with soil and straw this is for drainage and will compost but will also stop a collapse as it gets higher. The type of soil and filling material is up to you, use what you have to hand rather than buying something specific. Remember to leave enough space for compost and top soil. You can then treat it as a raised bed. 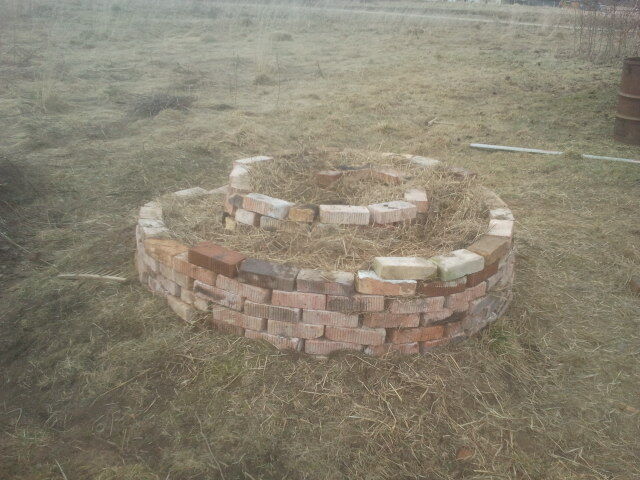 The top has a little more sand and straw mixed in with the compost to aid drainage. Traditionalists will have you believe that the spiral should go clockwise in the northern hemisphere and anti-clockwise in the south, but we are liberals so you can make up your own minds. When it’s finished, water it well and allow it to settle. Then you can start to plant it up, the choice of herbs is up to you just bare in mind that the ones which require more drainage go at the top while ones which prefer wetter conditions go at the bottom. One thing to bare in mind is the final height of the herb to be planted as this will effect what can be planted next to it due to the shade it will cast. And like with vegetable growing there is no point filling it with rare and beautiful herbs that you never use, think of what you like and use then find a place for it. Overall, Herb Spiral Gardens make an attractive addition to your garden as well as being very productive. Dit artikel is geplaatst in construction, foods, Garden, tips&tricks en getagged building, construction, food, Garden, green, IzReaL.eu, natural, organic, science, Spiral herb garden, sustainable, tips, understanding, value. Bookmark hier de permalink.